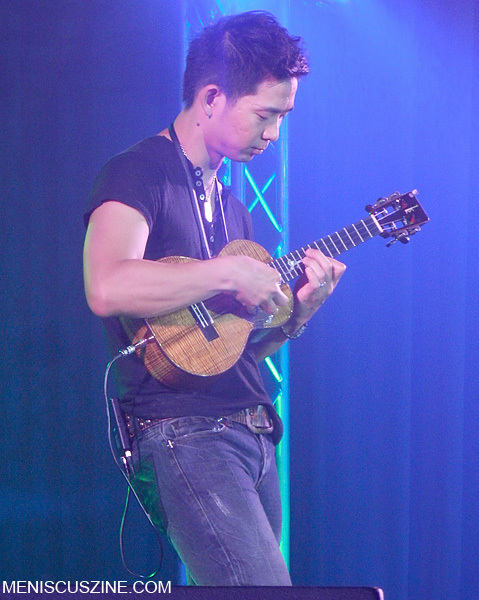 Ukulele virtuoso Jake Shimabukuro, live in Bangkok! Jake Shimabukuro, the fifth-generation Japanese American who honed his musical skills on the ukulele growing up in Hawaii, recently concluded his brief Asian concert tour in Bangkok with a stop at the legendary Scala Theatre, a 1,000-seat auditorium usually reserved for single-screen Hollywood movie showings. The concert – which took place July 3 following appearances in Japan, Hong Kong and Taiwan – marked Shimabukuro’s first performance in Bangkok and first-ever visit to Thailand. He lamented that, although he had looked forward to visiting Thailand for quite some time, he could only spend a mere 24-hour stop that consisted of downing pad thai and every color of curry imaginable for lunch, performing and then catching an early flight the next morning. Following the concert, Shimabukuro held an onstage meet-and-greet with fans, many of whom brought their own CDs and ukuleles to be autographed.